The Mortlock Islands flying fox, a large, breadfruit-eating bat native to a few remote and tiny Pacific islands, has long been regarded as one of the world's least studied bats. For more than 140 years nearly all that scientists knew about this animal was derived from one lonely specimen preserved in a jar of alcohol in the Natural History Museum, London. Today, in a paper in the open access journal ZooKeys, a team of bat biologists led by Don Buden of the College of Micronesia published a wealth of new information on this "forgotten" species, including the first detailed observations of wild populations. And it is none too soon, says paper co-author Kristofer Helgen of the Smithsonian's National Museum of Natural History, as the low-lying atolls this bat calls home are likely to be increasingly affected by rising ocean waters brought on by climate change. "Very little is known about many of the mammals that live on remote Pacific islands, including this beautiful flying fox," Helgen said. "This study gives us our first close look at a remarkable bat." The lone London specimen was collected in 1870 from the Mortlock Islands, a series of atolls that are part of the Federated States of Micronesia in the west-central Pacific Ocean. British biologist Oldfield Thomas used this specimen to name the species Pteropus phaeocephalus in 1882. But during a recent study of the bat, Buden discovered that a German naturalist voyaging on a Russian expedition had observed and named the animal some 50 years earlier. "We found a report written by F.H. Kittlitz in 1836 describing his expedition to the Pacific Islands in the late 1820s. 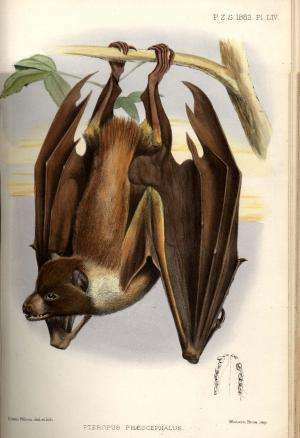 In that report he describes the flying-foxes of the Mortlocks and names them Pteropus pelagicus," Buden said. "This means the species was named long before Thomas's description in 1882." According to internationally established rules for naming animals, the earliest available scientific name of a species must be officially adopted. In the ZooKeys paper the scientists comply with this rule by renaming the Mortlock Islands flying fox Pteropus pelagicus. Not only does Kittlitz correctly deserve credit for the discovery of the species 50 years earlier than previously thought, but he can now also be credited for its "new" original name. During their research—which involved careful study of the skulls and skins of related flying fox species in 8 different museums on 3 different continents—the researchers straightened out a second point of confusion in the scientific literature regarding these animals. 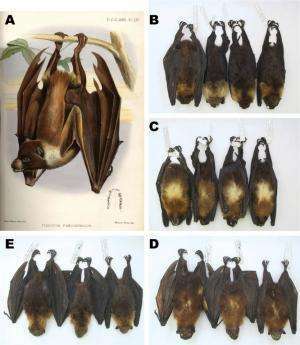 They demonstrated that flying foxes from the nearby islands of Chuuk Lagoon, long regarded as the separate species Pteropus insularis, are best regarded as a subspecies of Pteropus pelagicus. This finding shows that the Mortlock flying fox has a wider geographic distribution than previously realized. New fieldwork on the Mortlock Islands revealed more than name changes. The article describes the first study of the behavior, diet and conservation status of this flying fox, finding that the Mortlock Islands support a small population of 900 to 1,200 bats scattered across a land surface of only 4.6 square miles. Legal rules have brought better protection to the species, which was once heavily hunted and exported for food. But the future of the species remains uncertain, Helgen points out. In their study of Mortlock Islands geography, the researchers learned none of the islands are more than a few meters high. Rising sea levels, generated by climate change, pose a serious threat to the flying foxes' habitat and its food resources through flooding, erosion and contamination of freshwater supplies. "When we think of climate change having an impact on a mammal species, what comes to mind most immediately is an Arctic animal like the polar bear, which depends on sea ice to survive," Helgen said. "But this flying fox may be the best example of a mammal species likely to be negatively impacted by warming global climates. Here is a tropical mammal that has survived and evolved for hundreds of millennia on little atolls near the equator. How much longer will it survive as sea levels continue to rise?"